"R1" and "R2" in the matrix codes mean that two sets of lacquers were sent to Rainbo to process two sets of fathers for faster manufacturing . 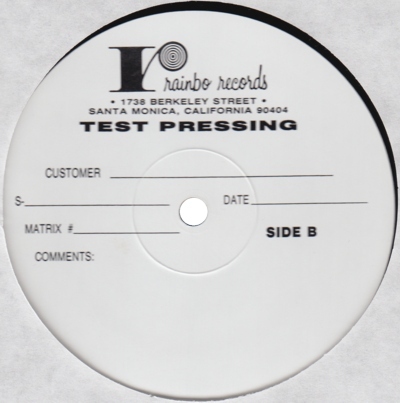 The test pressings were made as R2/R2 pressings, but they were mixed when pressing the retail records as seen from the matrix codes above. Despite the slightly different matrix codes, they are from the same cut. They were cut using two lathes in tandem, a master Scully lathe (TML-M) for R2 and a slave Neumann lathe (TML-X) for R1 . There may be small differences between the two cuts, caused by the different types of lathes. 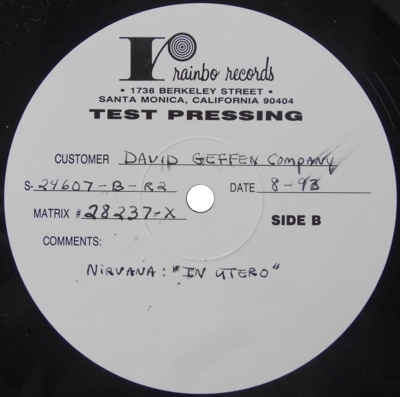 Three to five copies have been found, all R2/R2 pressings, of which at least one came from a Rainbo employee. 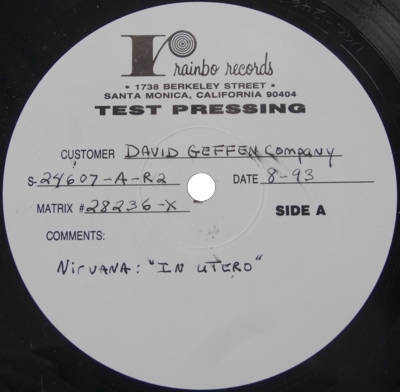 Copy 1, sold on eBay in 2013, has what looks like the exact same damage on the Rainbo logo on side A as one which was sold on eBay in 2004, but the seller claims the record came from a different source. Copy 2 below also has some damage in the same area of the Rainbo logo, though less severe. Copy 3 came in a white die-cut sleeve with the title handwritten in red felt tip pen. 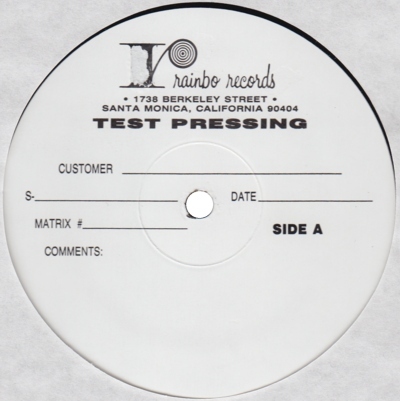 R1/R1 test pressings have not surfaced yet. It may have been sufficient to only test one of the sets.